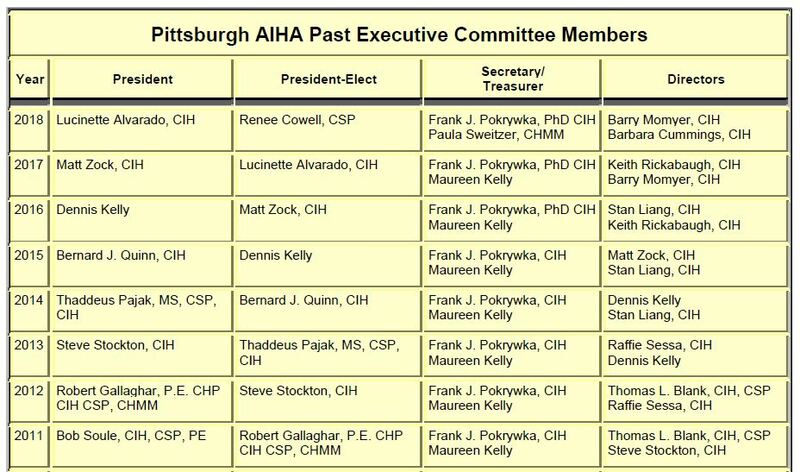 The table below provides a list of past committee members of the Pittsburgh AIHA. Click the link below to download the complete list of committee members since 1940! 1989 Frederick M. Toca, PhD. 1983 Charles E. Powell, Sc.D. 1956 Lester V. Cralley, Ph.D.
1953 Henry F. Smyth, Jr., Ph.D.
1943 Helmuth H. Schrenk, Ph.D.
1939 William P. Yant, Sc.D. 1957 Helmuth H. Schrenk, Ph.D.
1956 Henry F. Smyth, Jr., Ph.D.
1947 William P. Yant, Sc.D. If you notice someone who is missing from any of the above lists, please contact us.